The core business model behind every web site, blog or service online is to get people to your web site. You can focus your efforts on paid advertising, media buying and social media but people are still always going to head over to Google to find what they are looking for. There is also a good chance that your web site isn’t going to be ranking in the top listings if you are completely ignoring your SEO. Everyone has mixed feelings on what works best with SEO and how much effort should be placed on keywords and inbound links. At the end of the day SEO does matter and thanks to a wide assortment of tools and tracking systems out there it’s much easier for site owners to improve their site rankings themselves and not have to dish out a ton of money to other so called “seo gurus“. 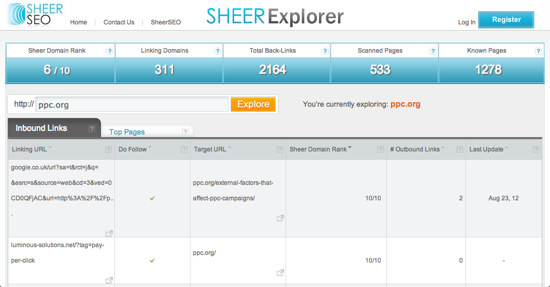 One of these tools is called Sheer Explorer from Sheer SEO. I’ve already written about Sheer SEO in the past a few times and how valuable their products and services are to site owners. Their new service called Sheer Explorer is a web based tool that allows anyone to look up a nice array of link building stats in just a matter of seconds. In the screenshot below you will see a quick report for PPC.org and how the site has a 6/10 Sheer Domain Rank, 311 domains linking, over 2000 backlinks and more. Even though the site is new, the service and data behind it is quite impressive. There are already over 10 billion scanned urls in the system with over 40 billions backlinks indexed as well. Of course new data is constantly being added to the site as more users submit urls and links continue to be created to sites. There are many services out there that can provide you with these same details and stats, but they also come with a price tag. 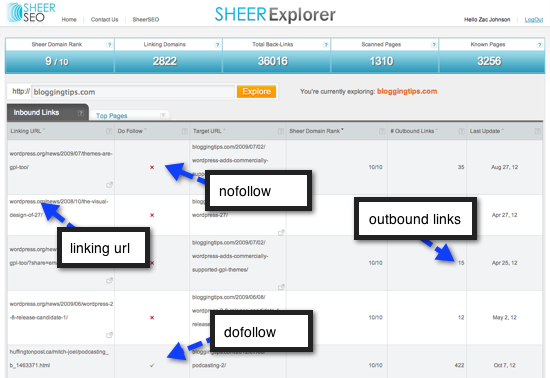 Sheer Explorer is free for anyone to use for up to three searches per day. Once you create a free account on their site you will have unlimited access to the system. Once you submit a url to the system you will be abel to analyze some important factors to the site, such as the inbound links and top pages that people are linking to. With an easy to read chart and breakdown you can quickly see which sites linking to yours are giving a dofollow or nofollow link. The Sheer Domain Rank (which is a “grade given to a domain by calculating its total known pages, inbound links, outbound links and few more paramaters.”) will also give you an idea of how powerful the site is that is linking back to your site. This tool can also be quite useful for anyone who is focusing their efforts on guest blogging and wants to get an idea of how high or low the site is in quality based on their inbound links, score and top pages. In addition to pulling a inbounds link report, you can also do the same to see what the Top Pages are for any site. Through the Top Pages report you will be able to see the specific URLs for a site, the title of the page, how many inbound links there are for the page along with the number of referring domains and the latest link activity update. Just like the inbound links report you can sort data by each column. The best way to experience to tool is to actually use it and see what it can do for you. They have a live demo on their site, or you can simply type in your own url on their main page. As site owners, content builders and SEO enthusiasts we all appreciate some good quick stats to help us create better ranking sites. Sheer Explorer is a quick tool that is easy and free to use and will make a perfect addition to any webmaster’s tool box. Be sure to check out their site and see how it can help you improve your on site SEO and rankings.